Named “The Four-Forty Parkway”, Interstate 440 provides a southern Bypass of Downtown Nashville between I-40 near Sylvan Heights and I-24 near Woodbine. The urban loop carries four lanes with added auxiliary lanes southeast to the four-level interchange with I-65 at Berry Hill, and six lanes east from there to Interstate 24. Interstate 440 is the lone remaining three-digit Interstate in Nashville. I-265 to the north of Downtown was renumbered as part of a realignment of I-65 in 2000. Interstate 440 opened first between Berry Hill and I-24 by Cunningham Heights. A parclo interchange (Exit 6) connects the urban loop with U.S. 31/41 Alternate (Nolensville Road), 1.25 miles ahead of Interstate 24. Photo taken by Chris Patriarca (05/18/03). I-440 travels below grade ahead of the separation into ramps for Interstate 24. 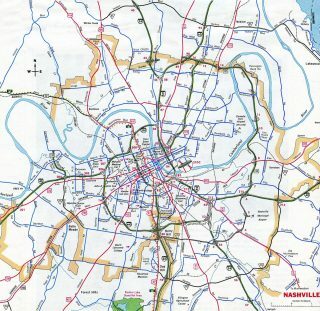 There are many rock cuts along both I-40 and I-440 in the city of Nashville. Photo taken by Chris Patriarca (05/18/03). A third diagrammatic overhead for Interstate 24 appears at the Stirton Road overpass. Photo taken by Chris Patriarca (05/18/03). Interstate 440 eastbound concludes. Interstate 24 will merge into Interstate 40 one mile to the north. Southward Interstate 24 sees another three interchange within the Nashville city limits as the highway continues another 24 miles to Mufreesboro. Photo taken by Chris Patriarca (05/18/03). Overhead sign assembly for Exits 54/Tennessee 155 and Exit 53/Interstate 440 west. The Briley Parkway makes up a northern beltline for the city of Nashville, representing a full freeway north of Interstate 40. Photo taken by Chris Patriarca (05/18/03). Advancing through the cloverleaf interchange (Exit 54) with SR 155, Interstate 24 continues a quarter mile to I-440 west. Photo taken by Chris Patriarca (05/18/03). Ramps from adjacent U.S. 41/70S – Lafayette Street and Murfreesboro Pike tie into the exchanges connecting Interstate 24 with I-440 west and I-40. Photo taken by Chris Patriarca (05/18/03). Two lanes part ways from I-24 west for Interstate 440 to I-40 for Memphis. I-24/40 merge ahead of Downtown Nashville, located four miles to the northwest. Nashville International Airport lies four miles to the east. Photo taken by Chris Patriarca (05/18/03). Eastbound on the Interstate 24/40 overlap at the Elm Hill Pike overpass. A supplemental sign advises motorists to take I-24 east for both U.S. 41 (Murfreesboro Pike) and adjacent I-440 west. Photo taken by Chris Patriarca (05/18/03). Branching southward from Interstate 40 along I-24 east, succeeding ramps depart for U.S. 41 and Interstate 440 west. Photo taken by Chris Patriarca (05/18/03). Traffic from I-40 to Interstate 24 east separates along two roadways through the exchange with Interstate 440. Photo taken by Chris Patriarca (05/18/03). Interstate 24 eastbound at Exit 53/Interstate 440 west. Traffic to Interstate 24 east from Interstate 40 westbound will merge in from the left ahead. Photo taken by Chris Patriarca (05/18/03). Westbound Interstate 40 as it nears Exits 213B/A for Interstate 24 east/Interstate 440 west. Interstate 440 again is signed for through traffic as it bypasses downtown to the south. Photo taken by Chris Patriarca (05/18/03). Interstate 40 maintains just two through lanes between the Interstate 24 east/440 west ramp departure and Interstate 24 westbound ramp merge. Exit 213 departs I-40 west next for Spence Lane. Photo taken by Chris Patriarca (05/18/03). Westbound Interstate 40 at Exit 213/Spence Lane. This local roadway connects with U.S. 41 to the south and U.S. 70 to the north. The Interstate 40 mainline is now signed as Exit 213B. Photo taken by Chris Patriarca (05/18/03). 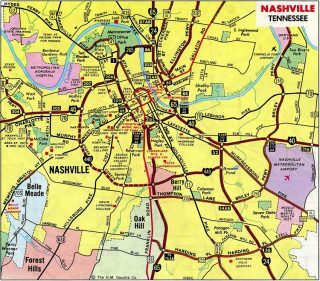 Interstate 40 turns to the northwest with Interstate 24 to downtown Nashville. Southward Exit 213A departs for Interstate 24 east and Interstate 440 west to south Nashville, Berry Hill, and Oak Hill. Photo taken by Chris Patriarca (05/18/03). Connecting with I-24 east, motorists from I-40 west remain separate from merging traffic along the ramp from I-40 east. Exit 53 follows in a half mile for I-440 west. Photo taken by Chris Patriarca (05/18/03). Ramps from both sides of I-24 eastbound combine along Interstate 440 west ahead of the Lyle Lane overpass. I-24 continues south 19 miles to Interstate 840 near Murphreesboro. Photo taken by Chris Patriarca (05/18/03). The roadway from I-40 west to I-24 east splits as traffic enters the two-wye interchange with Interstate 440. Photo taken by Chris Patriarca (05/18/03). Interstate 440 turns northward at its final mainline interchange with Murphy Road. Pictured here is the 0.75 mile diagrammatic sign for Interstate 40. Photo taken by Chris Patriarca (05/18/03). One half mile south of the western terminus of Interstate 440. Two lanes are available for Interstate 40 west to Memphis and Interstate 40 east to downtown Nashville. Photo taken by Chris Patriarca (05/18/03). Interstate 440 concludes. Interstate 40 travels three miles to the east into downtown Nashville. Westward Interstate 40 meets Tennessee 155/Briley Parkway in two miles and the city of Memphis in 191 miles. Photo taken by Chris Patriarca (05/18/03). Interstate 40 eastbound at the 46th Avenue North interchange, one mile west of the split with I-440 at Exit 206. Through traffic to Knoxville via I-40 east is advised to bypass the Nashville central business district via Interstate 440. Photo taken by Chris Patriarca (05/18/03). One half mile west of the Interstate 40/440 split on Interstate 40 eastbound. Two lanes facilitate traffic to the south bypass of Nashville as Interstate 40 continues eastward with three lanes to Interstate 65 and downtown. Photo taken by Chris Patriarca (05/18/03). Southeast from I-40, Interstate 440 meets Interstate 65 in five miles and concludes at Interstate 24 in eight miles. Photo taken by Chris Patriarca (05/18/03). Interstate 40 turns to the northeast toward downtown Nashville. Interstate 440 eastbound curves southward to U.S. 70S/Tennessee 1 and U.S. 431 before meeting Interstate 65 near Berry Hill. Photo taken by Chris Patriarca (05/18/03). Interstate 40 westbound turns to the south at Exit 207/28th Avenue North, 0.75 miles out from the Interstate 440 western terminus. Tennessee State University is situated just to the west of Exit 207 and north of Exit 206/Interstate 440. Photo taken by Chris Patriarca (05/18/03). Westbound Interstate 40 westbound expands to four lanes as it nears Interstate 440/Exit 206. 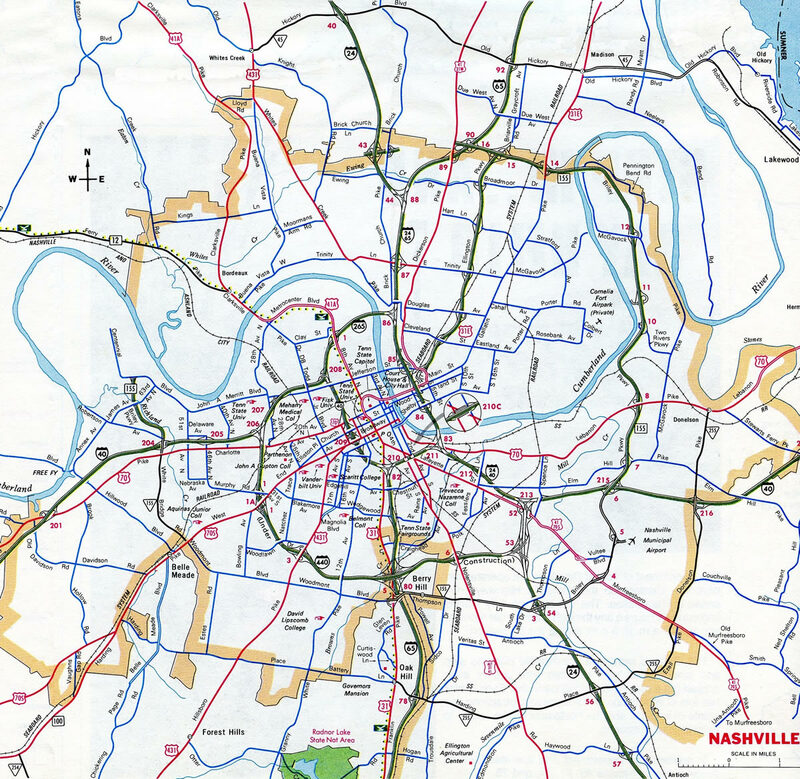 There are three remaining interchanges along Interstate 40 within the city limits of Nashville. Photo taken by Chris Patriarca (05/18/03). Interstate 440 eastbound split from Interstate 40 west. Interstate 40 turns back to the west en route to the city of Jackson in 126 miles as Interstate 440 travels southward 104 miles north of Huntsville and 185 miles north of Birmingham, Alabama. Photo taken by Chris Patriarca (05/18/03). “BYGONE DAYS – AUG. 13.” Commercial Appeal, The (Memphis, TN), August 13, 2004. “Interstate 440 turns 25 with a history of successes and setbacks.” The City Paper (Nashville, TN), August 7, 2011. “I-440 eastbound to be closed 10 weekends into fall.” Associated Press State Wire: Tennessee (TN), June 24, 2013. Page updated February 11, 2016.